The West Elm catalog is a home decor catalog/furniture catalog that sells contemporary and modern furnishings from your home. Throughout the pages of your West Elm catalog, you'll find rugs, window coverings, lighting, wall and room decor, bedding, and items for your bath and tabletop. Every month of the year a new catalog is sent out, but you can customize how often they come. To get your free West Elm catalog, visit West Elm's website, specifically their Request a Catalog page, and fill out that form. The form asks for your email address too, but you need to provide your full name and the mailing address for where the catalog should be sent. When you're done filling in the form, click the SUBMIT button to submit your request for the current West Elm catalog. You'll receive your West Elm catalog within 7-10 days at the address you provided. Tip: If you want to change how often you get the print catalog, go to their Catalog Mailing Options page to change your preferences. If you do provide your email address in the form, you'll be set up with West Elm to get special offers and other news delivered over email. If you ever want to cancel your email subscription, just visit their Email Options page. Don't want to fill out this form, or is it not working for you? You should be able to request a free catalog from West Elm by calling their customer support at 1-888-922-4119. West Elm catalogs are only mailed to address in the United States, United States territories, and APO/FPO addresses. If you live elsewhere, you can still see the West Elm catalog online (see below). Tip: If you have a new address and would like to change where your West Elm catalog is being shipped, you can do so with the Catalog Address Change form. You must be 13 years or older if you want to sign up for emails from West Elm. 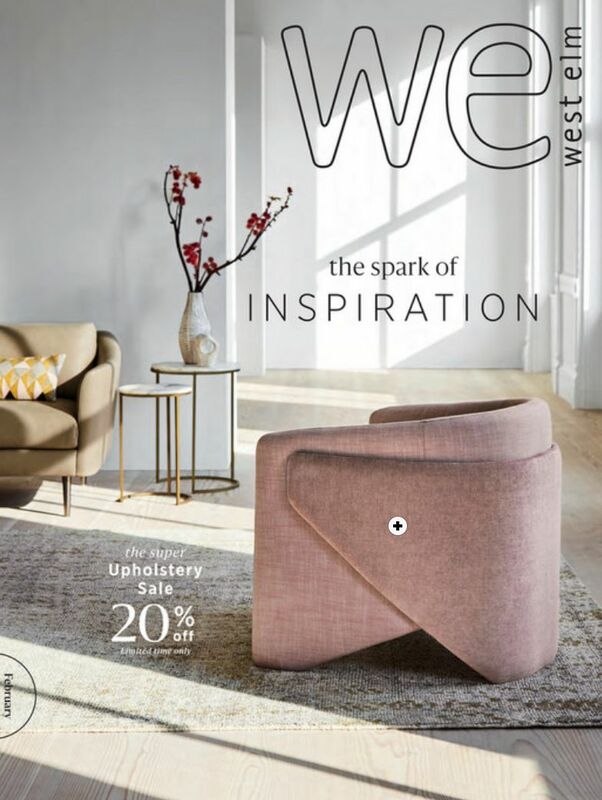 If you don't have a valid mailing address to get the print catalog or if you want to see the West Elm Catalog online right now, go to West Elm's Online Catalogs page. You can read not only the current catalog but also several past catalogs, one for each month, all for free and without a waiting period. To get started, click on the catalog you want to read. The controls for using the catalog are at the very top of the catalog, above the images. There's a print button, thumbnail button to easily click through to a new page, buttons for flipping left and right through the catalog, a share button, and a fullscreen button. You can also turn on an auto flip to automatically turn through the pages. A bookmark, zoom, and search tool are included too. If you like West Elm Catalog, you might also like catalogs from Pottery Barn, IKEA, Crate & Barrel, Restoration Hardware, and Grandin Road. You don't have to shop at West Elm just through their print or online catalog. You can also use their website at Westelm.com. It's easy to shop at the West Elm website because there are menus to separate all the different items, like Furniture, Outdoor, Bedding, Bath, Rugs & Windows, Lighting, Pillows & Accessories, Wall Decor & Mirrors, Tabletop, and Gifts. There's also a New and Sale menu for finding the newest products added to their website as well as all the discounted items. Within the Sale menu are subsections for finding what's discounted in each of the categories mentioned above. We like the Deals Under $20 page because it combines all the categories into one and shows you just the cheapest sales.